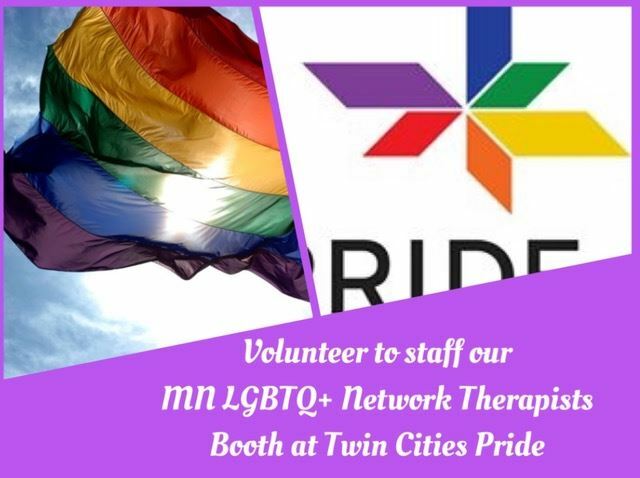 MN LGBTQ+ Therapists' Network - MN LGBTQ+ Therapists Volunteer at Our TC Pride Booth! MN LGBTQ+ Therapists Volunteer at Our TC Pride Booth! The MN LGBTQ+ Therapists Network will have a booth at Twin Cities PRIDE Festival 2018 and we cannot wait! We will need volunteers to transport the booth, set-up, staff the booth, and tear-down the booth. You may select up to as many slots as you please. Please arrive at least 10 minutes early to be debriefed, get settled in, etc.